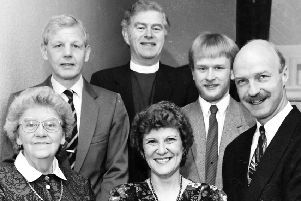 A concert taking place in Linlithgow next month will be a legacy for one of the Royal Burgh’s most respected former citizens. Julia Wade, who died in 2012, was an academic, former town councillor and founder of Linlithgow Arts Guild. Thanks to her efforts, the Scottish National Orchestra played in the town in 1969, an event which led to the setting up of the cultural organisation. She left a number of legacies and one was for a special concert of classical music in the town. Members of the current Arts Guild have selected Scottish Ensemble to perform at St Michael’s Parish Church on Saturday, March 5 at 7.30pm. Also founded in 1969, the ensemble is a group of 12 Scottish string instrumentalists and their performances appeal to a wide range of audiences. The repertoire they will play next month reflects Julia’s own personal likes but is also designed to appeal to those who may not often listen to classical music and includes Mozart’s Nachtmusik and Britten’s Simple Symphony. Tickets – £14 and £5 for students – are available from Linlithgow Burgh Halls on01506 282720 or online atwww.